The rich, dark color of this wine catches you from the first pour. It exhibits a rich deep burgundy hue with perfect clarity. The aromas are a compendium of zesty black cherries, blackberries, black raspberries, and cedar with elements of chocolate, dark roasted coffee bean, leather and spices. The first initial sip fills the mouth with raspberries, sweet ripe black cherries, plums, mocha and a taste of fresh baked blackberry pie, while maintaining absolute dryness and firm, round, yet supple, tannins. 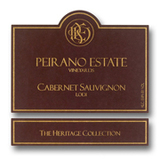 This delicious rich, full, mouth filling Cabernet is ready to drink now and will continue to age gracefully.